Convenient compartmentalized cryo safe storage boxes. Will accept vials from 1.2 ml up to 5 ml. There is a printed grid on the cover for labeling purposes. These boxes can handle temperatures from +121° C to -196° C. Bel-Art also offers a convenient rack that holds from 4 to 8 boxes. These racks come with a carrying handle. These reusable covered polycarbonate storage boxes are designed to hold 25, 81 and 100 cryogenic vials. They are autoclavable and have a temperature range of -196° C to +121° C. A plastic vial picker is included with each box. This polypropylene heavy duty vial caddy holds (48) 23mm diameter glass vials. The caddy is made from a solid 1 1/4″ solid block and has non-skid feet. These autoclavable polycarbonate workstation racks support all the Cryoclear™ cryogenic vials. They have anti-slip rubber feet with a temperature resistance of -196° C to 121° C.
These small Bel-Art polypropylene racks will hold most small vials and bottles. Dimensions: 5.08″L x 4.15″ w x 1.70″H. 4 Racks per case. 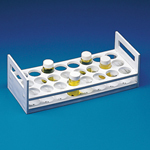 This Bel-Art scintillation vial rack holds twenty four 20ml. vials. It is made of corrosion resistant, autoclavable polypropylene. 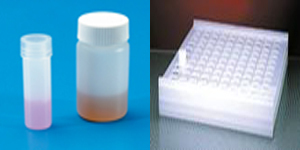 These stackable modules can be stacked six high and provide storage for hundreds of 13 mm sample cups. They are made of clear acrylic with a white base. A white cover can also be purchased for both the 50 and 100 cup trays. These trays are designed to be used with sample cups (item# 202114). These screw cap scintillation bottles are made of a special grade of high density polyethylene. They achieve the best counting efficiency with lowest background. Leak proof cap has Quick-Twist thread. The scintillation polypropylene rack is autoclavable and resists both nitric and hydrochloric acids.